Client: Clam Lake Beer Co.
Clam Lake Beer Company is a Cadillac, Michigan’s only brewpub and it’s located in the cute downtown space. They have a yummy food and beer selection, offering over 40 different beers including 8 of their own brewed on location. I was asked to redesign the menu, and have maintained the updating of the menu since. I broke it up and organized it into more columns to fit all the items and still maintain some design flair that compliments the interior design of the restaurant. It’s a one page, synthetic paper, water and tear-proof menu. The back side offers historic photos of Cadillac’s earliest industrial beginnings. 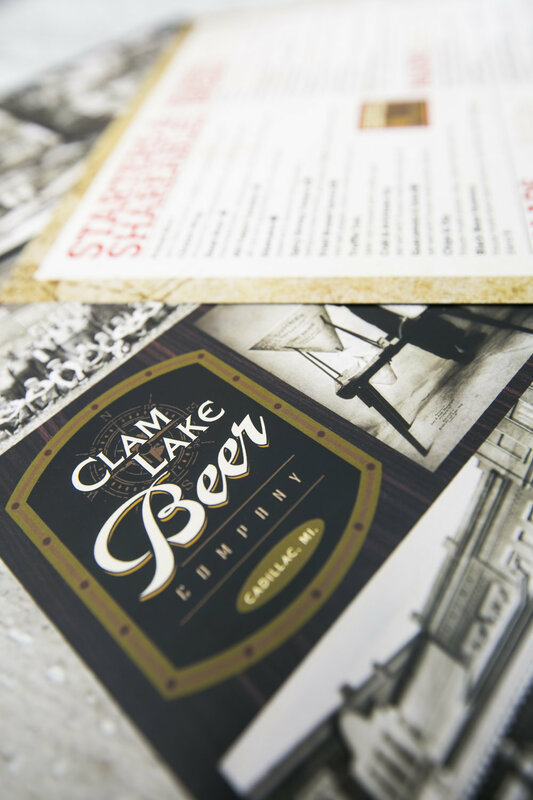 I also worked on their Brew Club logo and membership forms for both Torch Lake and Cadillac locations, carrying across the style developed for the main food menu.